Make use of that fine Irish Summer weather and hit up any of the amazing coast lines we are blessed with. If you’re passport is burning a hole in your pocket, then it is with good reason! There are tonnes of amazing locations for you to have your stag party abroad. Prague, for example, has a legendary club scene where you and the lads can tear it up. You might have ten million friends and only really get on with your best mate and your cousin. Consider who you invite on your stag night. Ask yourself, what would you really enjoy? If it is hitting up the parents house for a barbecue with a group of the lads and watching the match – so be it! You might rethink inviting your wildest college friend, then again – he might be the very person you want to take inspiration from for this event! Take this as a good excuse to try something you have always want to try. This may or may not be Bubble Soccer, but we have a sneaking suspicion that it is. 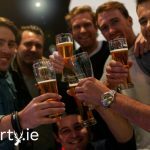 Arranging an off-the-wall activity like this is a great way to do something that isn’t drinking heavily – although their is likely to be pints after in many cases. So there you go! The recipe for the ultimate Summer stag. Enjoy this exciting time with your fellow brethren before heading down that aisle!